More than two centuries later, visitors to Lewis & Clark County continue to experience this natural wonder. What the casual observer might miss, however, is another inspiring sight along the river. As early as 500 AD, Native inhabitants began painting rock surfaces in what is now Helena National Forest. These pictographs (not to be confused with petroglyphs, which are carved into rock) are typically found on cliffs at the entrance of narrow canyons, which archeologists believe was done deliberately to signify the entrance of a supernatural site. Paint was mixed using various ingredients, such as iron oxide or charcoal, and applied with the fingers, a brush, or other utensils. Subjects include hunting scenes, handprints, and finger lines that have been interpreted as human-like figures, possibly shamans in soul flight. These “distended bodies” can be found at rock art sites around the world. 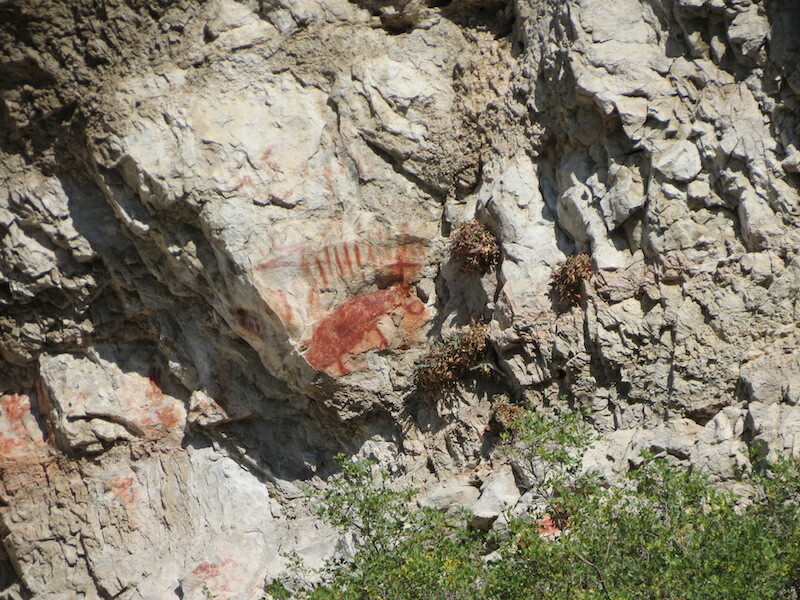 In central Montana, many pictographs show evidence of scraping, scratching, repainting, and spattering. Though it is unclear what the purpose of this was—possibly to capture the power of the figures or perhaps to cancel it—this interaction appears to reflect some type of ritual common to the area. Today, rock art sites at Helena National Forest are meant only to be viewed, not touched. Because they are so old, they are also quite frail and rare to come by. Observers should respect the historical significance of these works, and their importance to Montana’s First Peoples.